It could be the way that the light plays across a glass façade or an unexpected perspective on a staircase, but it is distinctly Bruce McCombs’ style and subject matter. Mesmerizing movement of light, reflections and shadows created on surfaces continue to capture his imagination. Cities, small or large, and diverse architectural elements within have revealed various possibilities for his paintings over the years. Bruce acknowledges that it can be challenging to find new perspectives, particularly in familiar places, but walking has been his method to see more, continually providing fresh opportunities. Knowing from stories shared that many people have wonderful memories of specific places on campus, he tries to see and help others visit them from a new angle. Coinciding with his 50th year on the faculty, an exhibition of his watercolors in the De Pree Art Center and Gallery this fall will reveal the discoveries that have resulted from his daily journeys through Hope. When Bruce is asked how long “it takes to do a painting,” the truth is that his whole process begins with the walking, then seeing and photographing. After this part of the process he will spend days and maybe weeks sketching the underlying drawing before he is ready to paint, which may take three to seven days more. Coinciding with Bruce McCombs’ 50th year on the faculty, an exhibition of his watercolors in the De Pree Art Center and Gallery this fall will reveal the discoveries that have resulted from his daily journeys through Hope. Before he seriously took up watercolors during a sabbatical period about 25 years ago, Bruce worked on etchings for the first 20-plus years of his career. Each etching plate could take months of working-over to develop depth and transparency to create one of his many award-winning prints. Once he put down the ink and dry point, he transferred the method to watercolor painting, in a technique called glazing. He thins the pigment and repeatedly paints over an area to produce a transparency which cannot be achieved in one swath of opaque painting. Hope’s ever-changing campus has provided intriguing subject matter for his work. He has never ceased to find something new for a painting, whether it’s 10 degrees and snowing or a sweltering summer day. 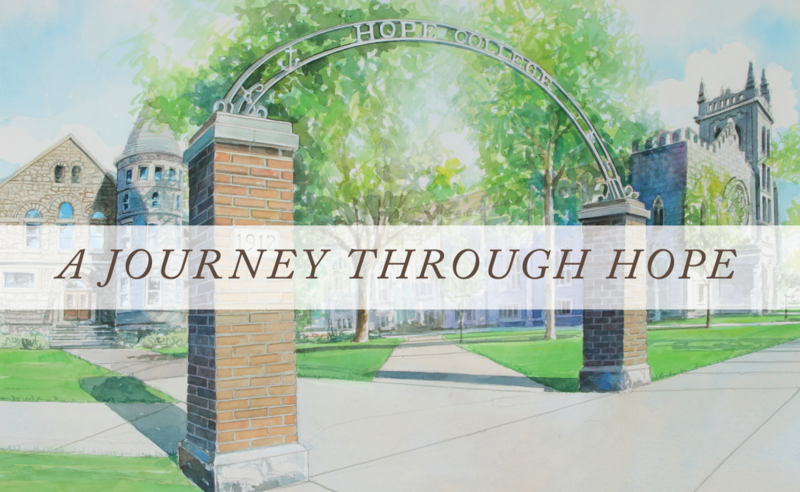 Some of those past works were displayed in solo exhibitions in the De Pree Art Center and Gallery in 2002 and 2011, and have also been featured on Hope College calendars and can be seen on the office walls of many of Hope’s buildings. Bruce will be showing his recent work in the forthcoming exhibition, which will run October 12 through November 9. Because it will be his final exhibition — since, having taught at Hope since 1969 he anticipates that he will retire before there can be another — he has chosen to add a few favorites that he has never shown. Hope’s ever-changing campus has provided intriguing subject matter for his work. He has never ceased to find something new for a painting, whether it’s 10 degrees and snowing or a sweltering summer day. Editor’s Note: Bruce McCombs will deliver an artist’s talk at the gallery, with a reception following, on Friday, Oct. 19, at 4:30 p.m., during the college’s Homecoming and Family Weekend extravaganza. For more about him and his work, please see the feature story in the August 2011 issue of News from Hope College.